For the fourteenth day in a row the alarm went off early, but I was excited by the prospect of the next section of the Path, that I’d heard rave reports about, and was keen to get going. The trail climbed out of Kingswear (across the river from where we’d finished the previous day) and worked its way around a stunning peninsula to Brixham, along the way taking me up and down some big and very steep climbs. I had the trail to myself, the weather was fair and I was back to loving it, even if I was only able to walk. As I neared Brixham I saw a familiar figure haring along the track towards me – it was Garry, the Lean Mean Running Bean – back out for some more Coast Path action. I’d become oblivious to the days of the week and hadn’t realized it was now the weekend, so there’d be no way that Garry wouldn’t find me and offer his support, even if it meant another long drive from his home in East Devon. It was great to see him again but as we walked he broke some bad news…. 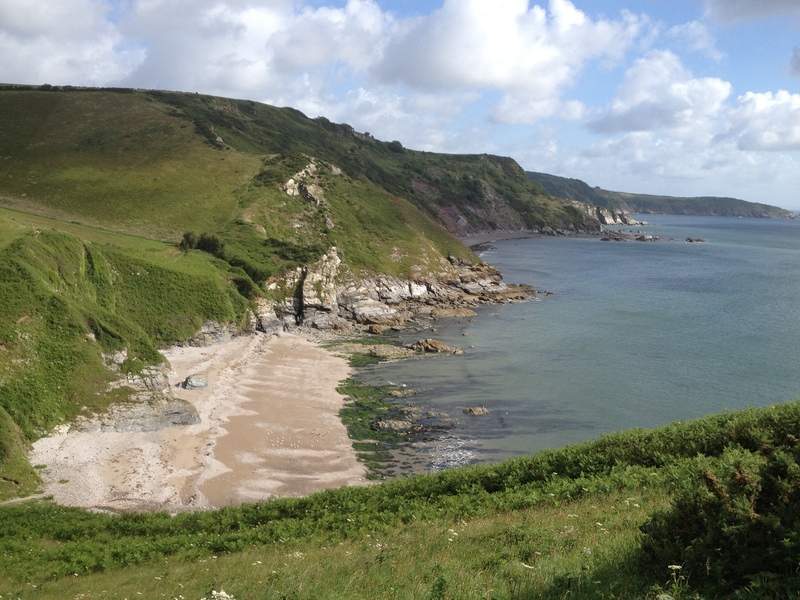 Towards the end of the Coast Path there is a section of the track that passes through a military firing range. This is frequently closed to the public and the only alternative route involves a massive inland detour on sealed roads. We had thought it would be open on Tuesday when I was now scheduled to get there. But Garry had been doing some more research and found out that it would actually be closed on that day! The only time I’d be able to do this section was the next day (Sunday). This was heartbreaking news and we spent the next little while figuring out our alternatives. The best solution, even though it involved an additional 4 hours driving, was to head east at the end of the day, stay in Weymouth for the night, do a long day on this section of the Path, then double back the next morning to pick up where I’d left off. It disrupted the flow of things and was going to cost both time and money, but it was the only way it could be done. On arrival at Brixham we briefed the support crew on the change of plan – lots of smiles there (not!) – and met up with my sister Hilary and brother-in-law Alex, who had driven down to join in the fun. Because I was walking, not running, it meant I got to do the next section with Hilary. This turned into a trip down memory lane as we approached Paignton, as this is where my mum grew up and was the place we had family holidays until I was about 6 years old. Of course we had to have an ice cream for old times’ sake! Whose dad? Not mine! Beinn denies any connection with deranged father. Paignton. We passed by the waterfront hotel where my parents had their wedding reception some 62 years prior and on through Torquay. This is one of the most built-up sections of the Path but on a sunny day it was pleasant enough. I now had Chris, another of Tom’s running club buddies who I’d last seen on Day 1, to keep me company and navigate our way through the maze of suburban trails that did a great job of keeping us off the roads and close to the sea. The pace had been gentle all day and was not about to change now. Further along we picked up Garry again and then a little while later I got the shock of my life when I saw, standing at the top of a hill just ahead of me, my cousin Graham, who had driven some 4+ hours from his home in Lincolnshire to show his support. 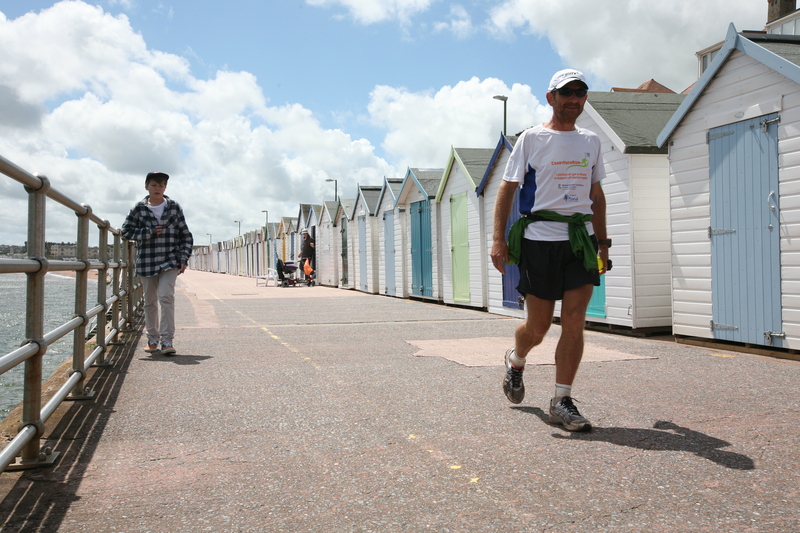 Further on again we picked up Mark Owen, one of the Coast Path managers who had been keenly following progress and also came out to show his support. This was starting to feel quite special! Early in the evening we reached Teignmouth, but again were too late for the ferry. For once it was just a short drive around, but while we were doing that the rain started once again. 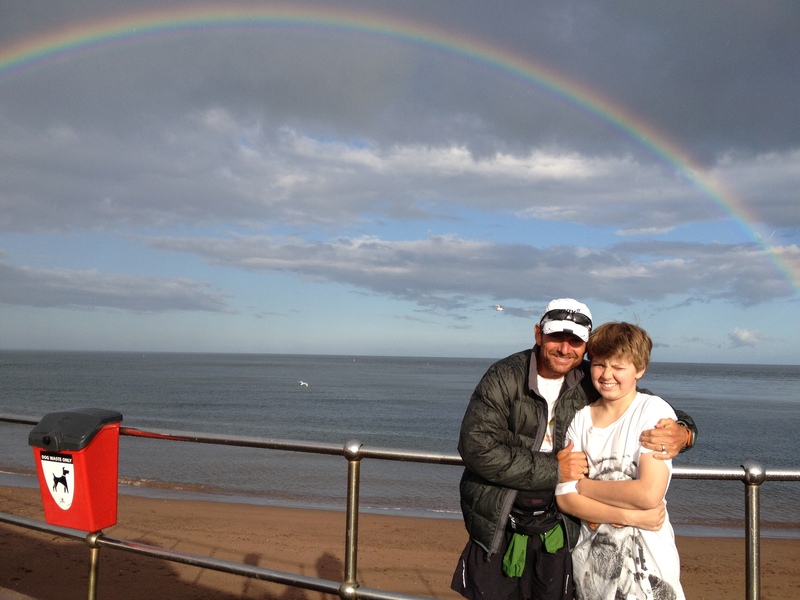 Under a spectacular rainbow, Phil & I set off on the final leg of the day, a 12 km haul to the Starcross ferry. We were 10 mins in when we realised we’d forgotten the map and the Path guide. This oversight had massive repercussions when some time later we found ourselves staggering through the twilight over sand dunes and mud flats, with not a Coast Path sign in sight. It took us well over an hour to blindly follow our noses in a circle back to the exact point where we first went wrong. After almost 15 hours on my feet I didn’t need this and the swear words fell like confetti from my mouth. The day’s exertions finally finished well after darkness had fallen over the Exmouth estuary but we still had an hour and a half’s drive east to Weymouth so I could tackle the firing range section of the Path the next day. Once again it was gone midnight before I could finally put my aching body to bed. There was a strange sight out of the window the next morning – a clear blue sky! We were staying in a hastily arranged B&B and this time I wasn’t going to miss out on a full English breakfast, that came complete with a 70’s era BBC-sitcom entertainment package provided unwittingly by the other guests and the landlady. It was one of those things that you had to be there to truly appreciate, but it was a golden moment that lightened my mood considerably. A quiet 65km Sunday stroll. Weymouth. An hour later I was lost on back streets of Weymouth where the Coast Path signs had sent me on a wild goose chase and my mood was once again taking a dive. 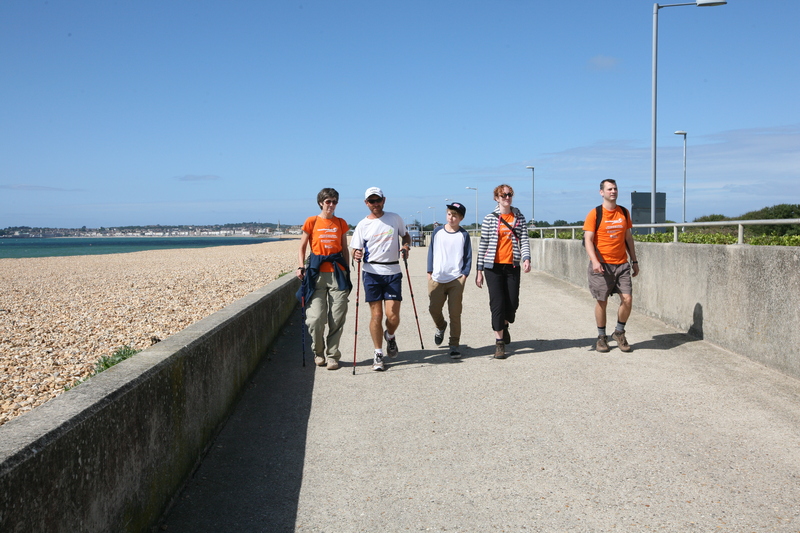 I’d knocked out the short section from Ferrybridge to Weymouth and was now meeting up with an expanding cast of supporters. This was ‘Family Day’ – I was being joined for much of it by my sister Hilary, my nephew Gordon and his wife Sarah (who had also run the very first few kms with us two weeks prior). Needless to say both Garry & Chris were in on the fun too. It was a glorious English summer’s day – at last! 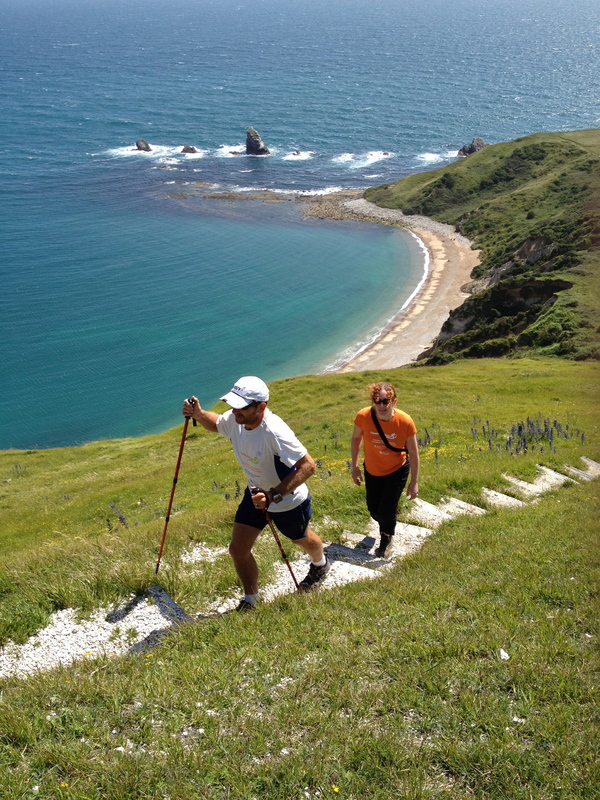 Ahead lay around 60kms of stunning coastline and big hills. It passed largely without incident and for the most part I was able to keep my shin pain tolerable through medication and a ‘Walk Only’ policy. Being a sunny Sunday the tourist attractions of Lulworth Cove and its surrounds were heaving with people, all of who were oblivious to what I had been through to get there. It was hard not to chuckle and feel even just a little bit smug as I watched the beer bellies sweat their way up the hill from their cars parked just a hundred metres away. Beyond Lulworth Cove we passed through the MOD firing range and marveled at the irony of the place – a stunning bit of countryside ringed by a high wire fence and in places littered with burned out tanks. But keeping our eyes seaward provided a visual feast and helped take my mind off the energy-sapping succession of sharp climbs that stood like a line of petrified breaking waves stretching off into the distance. In the late afternoon Gordon, Sarah and I reached Kimmeridge Bay and said our farewells. It had been wonderful to share just a small part of this experience with some of my family, but now it was time to say goodbye. The final part of the day called for a 4-hour solid walk around St.Alban’s Head and more stunning (and yes, hilly) coastline, this time with the faithful Phil chaperoning me. I was thrilled to have had an incident-free day under blue skies and the opportunity to see this glorious bit of the planet at its best, but I was getting very tired as we neared our goal. We spotted Durlston Head lighthouse from some way away but it seemed to vigorously resist our attempts to get any nearer. 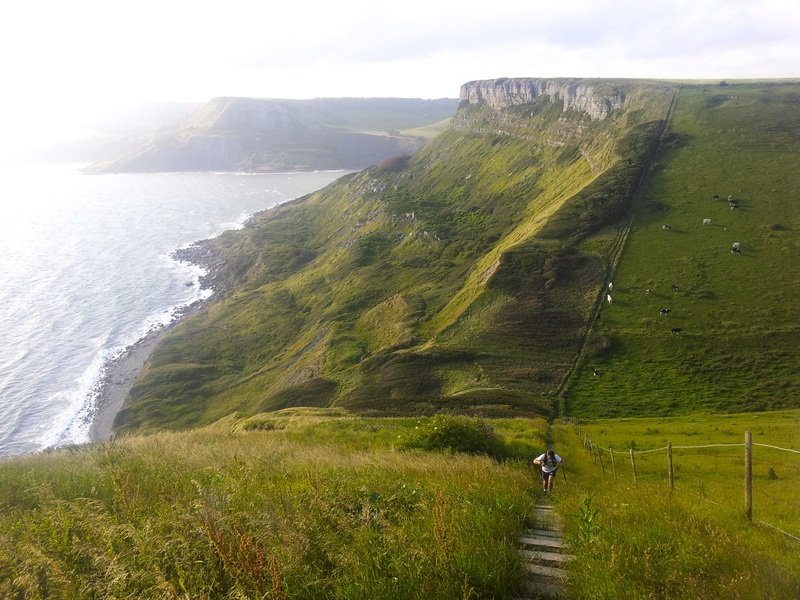 But eventually we reeled it in, traversed a last cliff-top section and dropped down towards Swanage. It had been another 13-hour day but I’d survived and right now that was all I was asking for. Love your description of ‘energy sapping climbs that resembled a succession of petrified waves breaking’. From a geologists perspective, thats exactly what you saw.